FARMINGDALE, NY and NEW YORK, NY (March 7, 2011) – Enzo Biochem, Inc. and the Spinal Muscular Atrophy (SMA) Foundation today announced that Enzo’s wholly owned subsidiary, Enzo Life Sciences Inc., has launched a unique immunoassay (ELISA) system which can be used for the identification and detection of Survival Motor Neuron (SMN) protein. The kit is the result of a collaborative agreement between Enzo and the SMA Foundation.for the development of reagents and assays for SMN protein. The availability of an effective SMN ELISA could further enable and expedite drug discovery, development and therapy for Spinal Muscular Atrophy, the leading genetic cause of mortality in infants and toddlers. SMA is a genetic, neuromuscular disease caused by progressive degeneration of nerve cells in the spinal cord that leads to muscular weakness and atrophy and increased risk for early death due to respiratory failure. It is estimated that SMA affects approximately 1 in 6,000 to 1 in 10,000 live births worldwide. The disease is linked to a mutation in or deletion of the SMN1 gene, resulting in reduced levels of SMN protein. An active area of therapeutics development has been elevation of SMN protein levels. “The SMN ELISA kit addresses a critical gap in SMA research and is expected to significantly accelerate SMA therapeutics development. Development and distribution of this system could not happen without the successful collaboration with Enzo and contributions from the SMA research community,” said Karen Chen, Ph.D., the Chief Scientific Officer of the SMA Foundation. 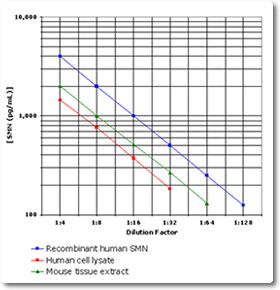 The Enzo SMN ELISA Kit provides a reliable and widely-accessible means for researchers to measure SMN protein levels, and greatly simplifies and accelerates efficacy assessment of potential drugs in clinical trials that are designed to increase SMN protein levels. The assay has been validated for use with human and mouse cell lysates and tissue homogenates, such as peripheral blood mononuclear cell (PBMC) lysates, and will be marketed through Enzo’s worldwide sales and marketing group. Except for historical information, the matters discussed in this news release may be considered "forward-looking" statements within the meaning of Section 27A of the Securities Act of 1933, as amended and Section 21E of the Securities Exchange Act of 1934, as amended. Such statements include declarations regarding the intent, belief or current expectations of the Company and its management, including those related to cash flow, gross margins, revenues, and expenses are dependent on a number of factors outside of the control of the company including, inter alia, the markets for the Company’s products and services, costs of goods and services, other expenses, government regulations, litigations, and general business conditions. See Risk Factors in the Company’s Form 10-K for the fiscal year ended July 31, 2010. Investors are cautioned that any such forward-looking statements are not guarantees of future performance and involve a number of risks and uncertainties that could materially affect actual results. The Company disclaims any obligations to update any forward-looking statement as a result of developments occurring after the date of this press release. Founded in 2003, the Spinal Muscular Atrophy Foundation is a nonprofit organization dedicated to accelerating progress towards a treatment and cure for Spinal Muscular Atrophy through targeted funding of clinical research and novel drug development efforts. Since its inception, the Foundation has awarded over $75 million for SMA research. In addition, the Foundation is committed to raising awareness and generating support for increased research efforts in SMA among the leaders of industry and government. For more information on the Spinal Muscular Atrophy Foundation, please visit www.smafoundation.org.